Increasing your home energy score and saving money is pretty easy. In fact, the most effective things you can do are the cheapest. We've put together a list of home energy improvements you can do to significantly increase your energy score and save a little money. Removing gaps and cracks in insulation can increase its efficiency up to 250%. Often times you can move insulation around to fill the gaps. If the gaps are too big, you'll have to spend a little money on more insulation. Do not put insulation near old canned lights or cover any knob and tube wiring because doing so can create a fire hazard. If you have vermiculite insulation it may contain asbestos and should not be disturbed until it has been tested. Heating vents in areas such as unfinished basements and garages increase your heating bill and lower your home energy score by up to 30%. Even if the vents are "closed" or temporarily sealed you are still loosing energy. 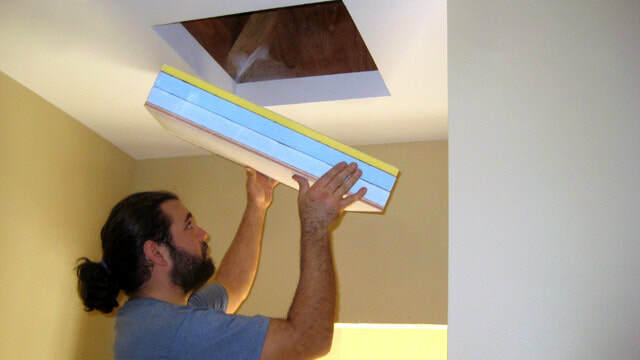 Remove and permanently seal vents in all areas of the home that are unfinished and not regularly used as living space. On average a home looses 20-30% of its heat from unsealed ducting. Mastic paste should be brushed on everywhere ducts are connected to permanently seal air leaks. Brush on mastic is a dirty job so be prepared. Mastic tape (foil backed Butyl tape UL listed for ducting) is the easiest and cleanest method of sealing ducting. Just peal and stick. Note: The City of Portland Home Energy Score Program only considers ducts "sealed" if they are sealed with mastic paste of tape. A lot of heat is lost through an uninsulated attic access panel. And, it's an easy fix. We recommend gluing a piece of solid foam to the back side of the access panel. You don't need anything fancy for this job.